Queen have released a trailer for the 40th anniversary release of their classic News Of The World album. The trailer features previously unseen footage of the band taken from Queen: The American Dream, a DVD documentary included in the Deluxe version of the album, which is released on November 17. 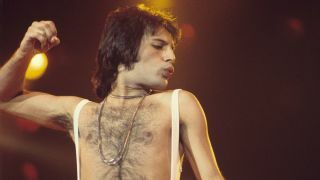 The documentary features footage shot on the band’s 1977 World Tour, when veteran British broadcaster Bob Harris and a film crew had unlimited access to the band, shooting footage for a film that was never completed or officially released. The film includes live action shot at the Houston Summit on the North American leg of the tour, as well more candid clips shot backstage. The anniversary edition will also include an ‘alternative’ version of the album titled Raw Sessions. This will feature never-before-heard versions of each of the album’s 11 tracks, and for the first time it’ll play for its full-recorded length rather than the edited 1977 album cut. A selection of bonus tracks make up a third CD, which will include a five-song live session recorded for BBC radio in October 1977. The deluxe version of the 40th Anniversary Edition of News Of The World can be pre-ordered now.